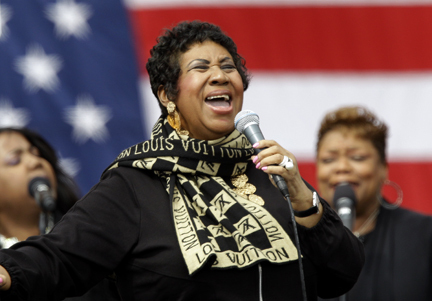 The “Queen of Soul” Aretha Franklin is set to perform on Wednesday, July 25 at the Nokia Theatre L.A. Live. It’s been about two years since Franklin last made an appearance in Los Angeles so the anticipation has been brewing for quite some time. With a colorful catalogue of music spanning over 6 decades, Franklin shared that it’s difficult to pick a favorite song to perform but she does favor the many renditions and twists she has put on the world famous track, “Respect” over the years. Speaking of reinvention, Franklin spoke about her new album she is working on with Clive Davis due out later this year (September). Being that Aretha Franklin is one of the greatest performance singers we have ever seen, male or female; I was interested in finding out what she considers her most memorable and precious performing moment? Franklin shared that no moment in her career was more precious than the experience of performing for President Barack Obama at the inauguration in 2009. Many people do not know but Senator Diane Feinstein of California, reached out on behalf of the Obama administration for her participation. With all that she has accomplished in her music career, Franklin was asked how she enjoys her time outside of music. She shared that like most women, she loves to “shop and peruse the market.” More importantly, she is watching and keeping up with her health. It was fascinating to learn how much she appreciates and adores sports. Not only was she aware of what’s going on in the sport of tennis, but she was up to date with the current NBA finals series as Oklahoma City Thunder face the Miami Heat in the 2012 NBA finals. She even had time to weigh in on the result as she predicts the Miami Heat will win the championship. With all of the traveling Aretha Franklin has done over the years it was interesting to find out what are some of her favorite destinations to visit or places she enjoys the most? Franklin hopes her journey to Los Angeles will be more pleasurable this time around. From the looks of things and the excitement brewing up to the show, the stage is set for an unforgettable and evening. In addition to working on her new album, she is working and producing her son Eddie. Franklin says that we can anticipate a really good R&B album that is radio friendly and has crossover potential. She plans to appear on the album in a duet with her son so we have to stay tuned to hear what’s coming. For more information on Aretha Franklin’s performance at the Nokia Theatre visit http://nokiatheatre­lalive.com/events/festival-detail/163.